Welcome to Day 11 of my holiday inspiration series. 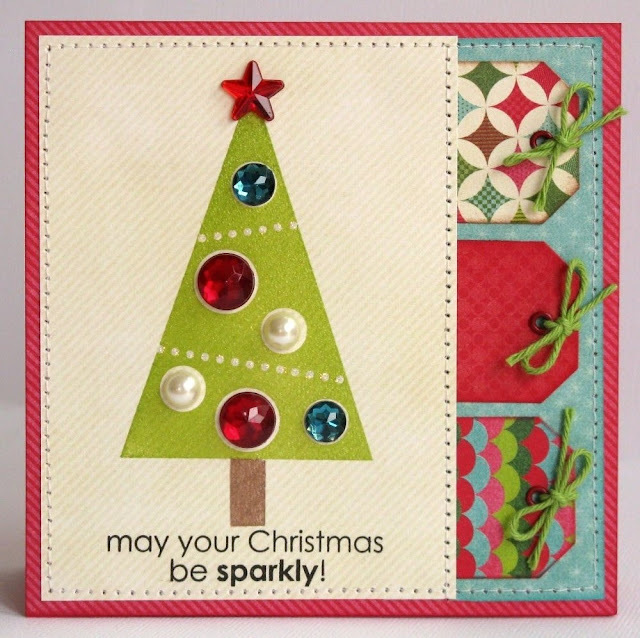 Today I have a sparkly Christmas tree card to share using Technique Tuesday's Be Jolly Stamp set designed by the amazing Teri Anderson! I stamped my tree with Green Pigment ink and then heat embossed it with clear embossing powder which gave the tree a little sparkle. I took it a step further by adding Stickles glitter glue to the beads and adding some mega bling from Teresa Collins in the spaces left for ornaments. The sentiment I wanted to use was a little long to fit in the space I had to work with so I cut it in half and stacked it below my tree. I cut my tags from My Minds Eye's 12 Days of Christmas collection (from a couple years ago) using Papertrey Ink's Fillable Frames #9 die and tying bows with Whisker Graphics Divine Twine. I'm pretty happy with how this one turned out. Every once in awhile the card world aligns and things go exactly as envisioned. ;) I hope you enjoy the rest of your Saturday!